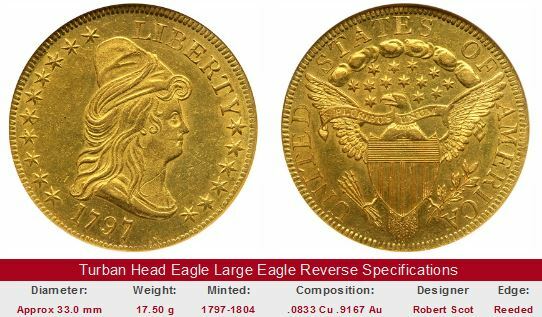 The $10 U.S. gold eagle, was the largest face value authorized by the 1792 Mint Act. It was intended to be America’s ambassador to the world, and was given the name “eagle” after the national bird symbolizing the new republic on the west side of the Atlantic. The first of the U.S. gold eagles was presented by Mint Director Henry W. de Saussure to President Washington in Oct 1795. A few weeks prior to the meeting with the president, the $5 half eagle of the same design was issued. Chief Engraver Robert Scot featured Miss Liberty wearing a turban cap of a style popular with women of that era. She faces right, the word LIBERTY above her at 2 o’clock and the date directly below her. The 1795 eagle has 15 stars. After Tennessee earned statehood in 1796, the coin was revised to carry 16 stars. The reverse shows an eagle with wings outstretched, holding a wreath aloft in its beak. The eagle sits on a palm branch, almost fully surrounded by the inscription UNITED STATES OF AMERICA. These early ten dollar gold pieces are called Capped Bust to Right Eagles. Many numismatists refer to them as Turban Head Eagles, after the cap style worn by Miss Liberty. The Great Seal of the United States was adopted in 1782 for official representation of the United States on legal documents. It pre-dates the Constitution by five years. The Great Seal has been modified several times since its inception. The above is how it appeared 1782-1841. 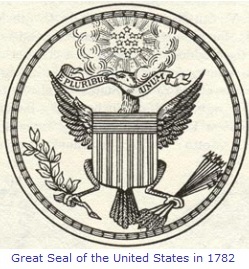 The Great Seal served as the inspiration of the large, or heraldic, eagle on early U.S. gold coinage. The eagle on the reverse was widely ridiculed as a weakling bird. Mint officials were concerned about the image of the United States conveyed oversees by U.S. coinage. A search began to find a more powerful emblem, one that would engender respect in the Old World. The Great Seal of the United States was finally chosen to grace the reverse. The Great Seal had been officially sanctioned in 1782 for display on diplomatic documents, but now it was to elevate the image of U.S. gold coinage to one suggestive of power and strength. Engraver Scot adapted the Great Seal to coinage. Basically, Scot copied the Union Shield from the Great Seal and superimposed it on the breast of an eagle that was not quite the same bird as seen on the Great Seal. In the opinion of some, Scot’s modification lacked the majesty of the original. The eagle grasped 13 arrows and an olive branch in its talons and held a E PLURIBUS UNUM scroll (meaning “Out of Many, One”) in its beak. The circumference is almost fully occupied by the inscription UNITED STATES OF AMERICA. Also, there are 13 stars above the eagle’s head. A band of clouds forms an arc spanning from wing to wing. The design whose reverse is based on the Great Seal is often called the large, or “Heraldic” eagle type. It first appeared on the quarter eagle in 1796, followed by the eagle and half eagle in 1797 (there are some half eagles with heraldic eagle dated 1795, but numismatic scholars believe they were struck in 1797). U.S. gold eagles of the Heraldic type continued only until 1804 because of excessive bullion profiteering. The Mint Act of 1792 rigidly set the value of silver to gold at 15 to 1 in the United States. At the time Napoleon of France began his attempted conquest of Europe, the free market bi-metallic ratio in London and Paris rose to 15.5 to 1. Tensions between the United States and Europe eventually pushed the ratio to 16 to 1. Under these circumstances, U.S. gold coins were worth more than their face value, if sold in Europe. Here is how the process played out: Speculators purchased gold coinage in the U.S. at a rate of one ounce for 15 ounces of silver, exported it to Europe where it was melted down and sold for 16 ounces of silver in exchange for one ounce of gold. The silver returned to the U.S. and the cycle repeated itself. Much of the Mint’s production of gold coinage was intercepted by speculators before it reached circulation. The loss of the flagship gold coin, the ten dollar eagle, was deemed especially egregious. President Thomas Jefferson ordered production of the eagle stopped in 1804. Production of smaller U.S. gold coins was sharply curtailed because of the same abuse. 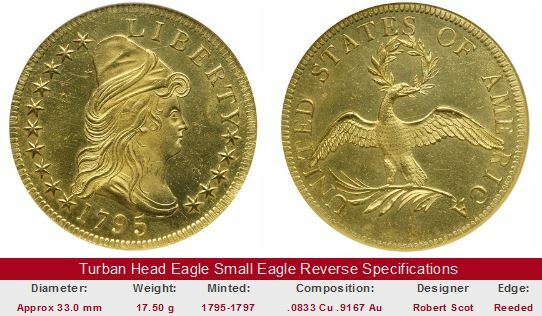 It wasn’t until 1838 that U.S. gold eagles were once again minted. As is common for early U.S. coins, Turban Head Eagles are noted for their many varieties, defined by the number of olive branch leaves, number and size of stars and their arrangement, and overdates. Many of the early ten dollar gold pieces have file marks, created by Mint employees to adjust the weight to meet legal specifications. Because these marks were made inside the Mint, they don’t count against the grade, but could affect value because of eye appeal. Turban Head Eagles are high dollar coins, make no mistake about it. It makes no sense to spend a minimum of $10,000 for an example that has not been certified by one of the four leading grading service companies: PCGS, NGC, ICG, or ANACS. You have some assurance of adherence to acceptable numismatic grading standards and a guarantee of authenticity. There are more than just a few stories of con artists capitalizing on collector excitement over Early Eagles to rip off inexperienced buyers of thousands of dollars. The links below take you to eBay U.S. coin auctions, where Turban Head Eagles up for sale are grouped together for your convenience. The link on the right hand side of the "1795 9 leaf" box is coded to bring up all auctions for Turban Head $10 gold with small eagle, not just the 1795. The "1797 Large Eagle" box is coded for, you guessed it, all auctions featuring Turban Head Eagles with large (a.k.a. Heraldic) eagle. Ditto for the The "1798 7x6 St" and the 1804. Value trends of the dates highlighted are shown on the left hand side of all boxes to give you an idea of how powerful the steamroller Turban Head Eagles have been for a long time. Collectors love them and always will, and will pay big money accordingly. There are many thousands of coins for sale on eBay at this moment, but there are not many genuine Turban Head Eagles. Eventually, one will show up. If you jump into what is sure to be a fierce bidding war, be sure you understand the advice above regarding third party grading.